Why did this piece of art resonate for you or seem like it would give you an avenue into writing about this subject? Poet Daniel Aristi: I was first drawn towards the hugely dissimilar meanings that the various sets of hands in the painting convey through what in fact amounts to very minor variations in the position of the fingers… Murder or redemption – fully opposing propositions – depend on whether a couple of fingers get bent or are kept straight. What surprises you in the poet’s response to your artwork? 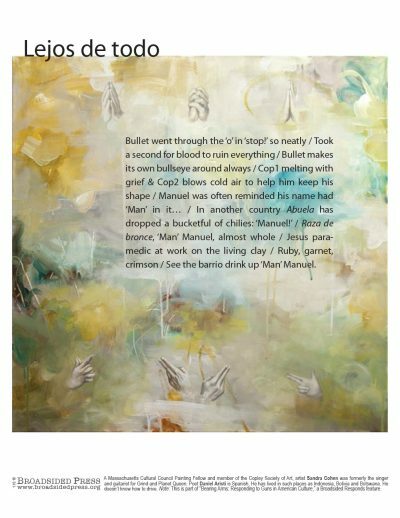 Artist Sandra Cohen: I love the avant-garde quality, the mix lyricism and story.